As the World Cup in South Africa this evening, we are launching a campaign encouraging our nations football fans to ditch drinking beer and champion cider as the official drink for this world cup. 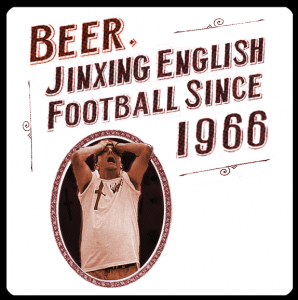 Beer’s been jinxing English football since 1966. Every pint of lager and ale has been a nail in the coffin of our national team for nearly 50 years. And only real cider can break the spell. 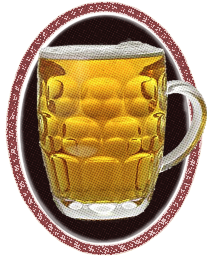 You can share your stories with other passionate football and cider lovers on the site. Were you, or someone you know drinking beer when England lost last time? Did real cider help? You can download our beer mats designs that have actually been placed in pubs across London and the South-East during the World cup. It’s a campaign that hopes to generate a lot of fun, and change the thinking of people in pubs drinking boring old beer or lager. So order a pint today and do your bit for Fabio and the boys in South Africa! 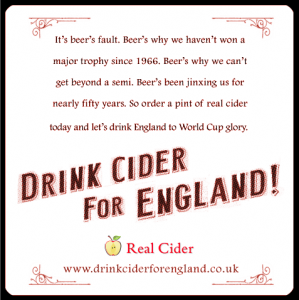 Designs of Beer Cider mats that are being used to market the ‘Drink Cider for England’ Campaign across pubs in the UK. Great idea, lets have more cider mats, the scope is huge, from promoting craft cider producers to humorous ones.